I had someone ask me yesterday if I could design a room that would be trend proof. I explained politely that I could design a room that went easy on obvious trends (Tiffany box blue and chocolate brown color schemes come to mind) so that someone could get more time out of a room before it looked dated, but to try to make something last forever is a fool's errand. A time-resistant kitchen is even more so. 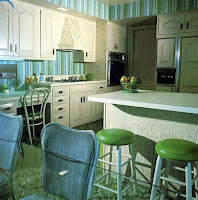 A kitchen in 2008 is the de facto center of a home and this is an entirely new concept. A kitchen 40 years ago was seen as a private area for the family, not ground zero of every social event on a homeowner's social calendar. From the looks of things, kitchen-as-the-omphalos will continue, and that's as good a guess as anybody's. Even so, it's a guess. For the sake of my livelihood, I hope it continues but who knows? Rooms and buildings that are considered to be classics now are considered to be classics only because they've been around long enough to have survived the winds of change and the ravages of time. I live in what's now considered to be a classic Florida structure. It's a beautiful pre-1920s frame building with original heart pine floors. It's a classic today because no one bulldozed it in the '30s, '40s, '50s, '60s, '70s or '80s when tastes changed. In 1955, this building would have been considered an eyesore and the people who owned it then lacked the means to tear it down and build something more in keeping with the times then. For most of this building's long life, it has been stuck in a time warp --retro before retro was cool. Who knows? The next ten years may bring in a wave of nostalgia for the '70s, heaven help us. All things Bicentennial may become the new stainless steel. I keep an issue of House and Garden from 1965 in my bookcase to keep me humble. 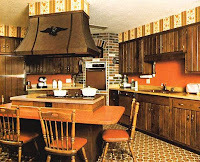 I was born in that year and the interiors featured in my old copy of that magazine are jarring to say the least. 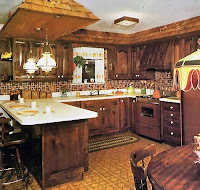 Will the glass mosaics and inspired color schemes I dream up now be as jarring to someone 40 years hence? You bet they will. But in the unlikely event that my designs are around in 90 years, I'd like to think that they will be considered to be classics. As I said, I'd like to believe that. But as I look at the photos that are accompanying this posting today, it really makes me wonder. Will any of this stuff ever look good again? (Man! 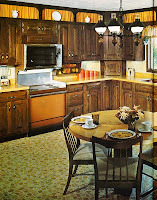 the yellow Congoleum floor in the first photo is the identical floor to the one that made my mother the envy of the neighborhood in about 1977) To my mind though, it's not something I spend a whole lot of time stewing over. I believe strongly that architecture and design should look like the time when they were created. I don't try to re-create 1940 (trendy now) any more than I try to re-create 1970 (most definitely not trendy now). In 2008, my clients use my projects differently than they would have 40 years ago. We have access to a world of products and services that no one could have predicted in a time long past. So the answer to the quest for trend-proof design is to look for quality and value. Something that's still working doesn't need to be replaced. A stainless steel refrigerator goes with any color scheme and will look better longer than a harvest gold one. Buy good stuff and let the winds of change blow past you. Shifting your expectations will make something more trend resistant than any color possibly can.